Choosing an AGS Stainless steel railing system added a luxurious, clean finish to the patio area. This nearly invisible railing system allows the surrounding natural beauty to be highlighted without distraction providing deck dwellers an ideal spot to enjoy the oceanfront views. “The home has a very beautiful yet delicate overall feel to it,” explains Gavin Engler, AIA, Associate with the award-winning office of Carol A. Wilson Architect. “Very thin structural columns of the glazed façade help define its overall lightness, further accentuated by the fine material choices and minimalistic detailing throughout…including the railing system.” While the design team had never utilized an AGS Stainless railing system before this project, their initial apprehension quickly turned to delight as the Rainier® cable railing, featuring a flat stainless steel top rail, started coming together within the porch area. “The railing was a very important design element so the screened-in porch felt as if it was an extension of the home’s gentle aesthetic,” adds Engler. Also it was essential to the homeowners and designers to optimize the views as seen while actually seated in the patio area. The thin cabling infill was the key. Engler stated, “It’s remarkable how they elegantly accented the thin vertical structural columns – then slyly fade into transparency when focus goes towards the breathtaking views.” Additionally, the sleek post profile blended in front of the porch-screen partitions perfectly. Sometimes considered a secondary design element, this project nicely exemplifies how railing systems should be anything but an afterthought as they quietly yet beautifully accent major design elements and bring spaces together into a overall cohesive look. AGS Stainless, a highly respected company within the industry offers the Rainier® as one of its various stainless steel railing systems. These systems can be accompanied with wide array of options including: top hand railing and mounting post, powder coating and tempered glass infill – for a fully-customized railing system at an affordable cost. With AGS Stainless, the overall design process is straightforward and simple: sketches and approximate dimensions are submitted; CAD drawings and all details of the railing system are created by a member of the AGS design team. Then an AGS railing expert works directly with the homeowner/contractor to make certain every detail is just right and to ensure prompt delivery with attentive service. Located in Casco Bay, off the coast of Maine, is the relaxing Chebeague Island. On the southeast shore, the Mill’s family established their tranquil island retreat. The 2,600 square foot home set on two acres features a collection of main-floor living spaces that include an accommodating kitchen, dining, and master bedroom, all with floor-to-ceiling windows showcasing a 180-degree view of natural seascape. Extending the overall living space is an inviting screened patio with impressive views of nearby Portland. This outdoor living area is well-appointed with a gas fireplace, ipe decking, and stainless steel railing system from AGS Stainless – elegant finishes which, differentiate this home as the recipient of the 2014 AIA-Maine Design Honor Award. Builder: Fine Lines Construction, Inc.
AGS Stainless manufactures stainless steel railing systems which are in demand all over the world. Their unique (and proprietary) way of manipulating dimensions provided by the customer allows them to fabricate custom railing configurations that rival anything built on-site. Cut with the precision of a computer-controlled laser and welded and polished by hand, each railing component reflects craftsmanship at its finest. The railing design options are as extensive as the production standards are high: round, flat and elliptical top rail; standard (36″, 42″) or custom post heights; cable, glass, bar or mesh panel infill with a myriad of end-fitting combinations; top or side mount post mounting methods, and more. For more information, visit: www.AGSstainless.com or call 888-842-9492. 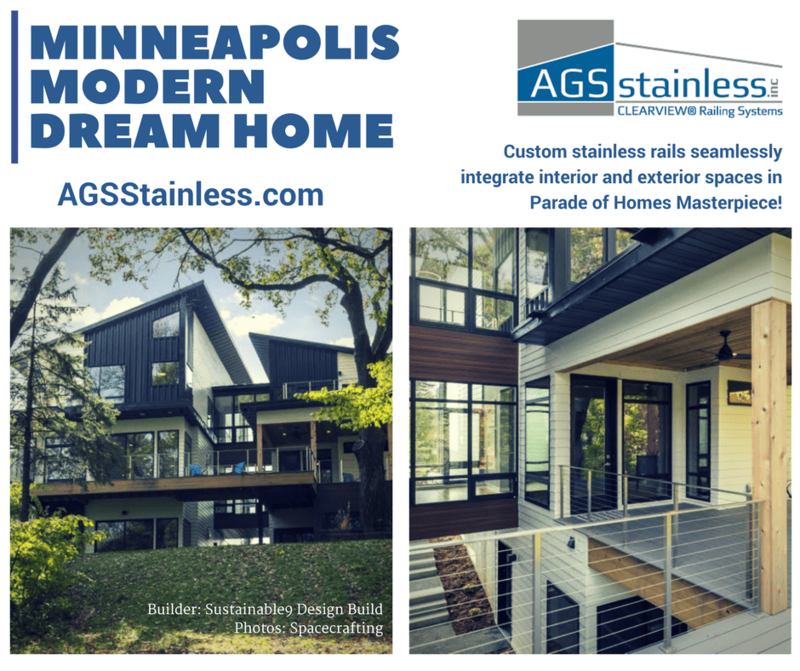 Minneapolis Modern Dream Home, AGS Stainless, Inc. Custom stainless rails seamlessly integrate interior and exterior spaces in Parade of Homes Masterpiece! (Complete Project Case Study with images can be found here) Overlooking the scenic Minnehaha Creek sits one of the most unique and energy-efficient homes in the greater Minneapolis area. This 5,144 square foot home features elements such as: a glass bridge spanning two separate wings of the home, a two-story fireman’s pole, kids’ bedrooms with their own private lofts and a modern staircase with open risers. The home is also composed of structural insulated panels providing the best in energy efficiency, and was awarded the coveted “Dream Home” designation in the local Spring 2016 Parade of Homes tour. The award was the second for the environmentally-focused, Twin Cities-based building and remodeling firm Sustainable 9 Design + Build. In the past, Sustainable 9 Design + Build utilized a local railing fabrication team to create custom railings for their homes. Increased new construction and remodeling activity happening throughout their Midwestern market backlogged those fabrication crews and caused them to demand premium prices. Time delays and increased costs simply were not an option on this custom home, so the Sustainable 9 team reached out to AGS Stainless. Another unique feature appreciated by kids both young-and-old is a two-story fireman’s pole. AGS Stainless designers worked closely with Sustainable 9 Design + Build to develop a custom locking access gate for this”transportation apparatus.” With the help of AGS’ Rainier cable railing, the project achieved an overall consistent look and feel that provides unobstructed views of all the natural beauty, both inside and out. Working AGS Stainless is straightforward and simple. They generate exact drawings and details for your project from initial approximate dimensions and photos submitted by the customer. Then, they work directly with the homeowner/contractor to make certain every detail is just right.”Each AGS Stainless railing system is designed and prefabricated at our facility located in the Pacific Northwest. Every individual nut, bolt and handrail fitting is just right. Author NADRAPosted on March 13, 2017 March 13, 2017 Categories Ask NADRA, Business Practices, Industry Brief, Industry News, Product Highlight, UncategorizedTags 2016 Spring Parade of Homes "Dream Home", AGS Stainless, AGS Stainless Inc, Edina, March Sponsored Content, Minneapolis Modern Dream Home, Minnesota, NADRA Sponsor, Spacecrafting, Sponsored Content, Sustainable 9 Design + BuildLeave a comment on Minneapolis Modern Dream Home, AGS Stainless, Inc.
Alpine Meadows Cabin, AGS Stainless, Inc. Situated on a 23-degree slope that receives some of the region’s heaviest snows, the steelframe structure’s poured-in-place concrete-mat slab is pinned to the hill’s underlying granite. Lead architect Alex Bergtraun undertook a considerable study of the steep site to create a driveway with a less than 5 percent incline that would allow the clients to pull in easily and, after a long day of skiing, enter the mudroom without having to navigate stairs. LED uplights throughout the house reflect warm tones from the Douglas fir ceilings, while hot-rolled steel on the fireplace and cabinets provides contrasting texture. Custom furnishings continue the rustic-and-industrial theme: Bergtraun built an extra-long dining table with a galvanized-steel top, large industrial wheels, and leftover glulam. Author NADRAPosted on February 13, 2017 February 13, 2017 Categories Business Practices, Industry Brief, Industry News, Product Highlight, UncategorizedTags AGS Stainless, Alpine Meadows Cabin, Architectural Record, Cabin, Miriam Sitz, Nevada Mountains, Studio Bergtraun ArchitectsLeave a comment on Alpine Meadows Cabin, AGS Stainless, Inc.
NADRA invites you to join us at our Inaugural West Coast Golf Tournament & Membership Drive to be held June 26-27, immediately following the US Open. The event will be held at The White Horse Golf Course, located about 1-hour away from Seattle. NADRA’s 2015 Golf Tournament & Membership Drive is an opportunity for you have a great time with others in the industry and to see and learn first-hand what’s new in deck & railing products. Sign up / Sponsor Now! NADRA member manufacturer AGS Stainless will be delivering this year’s Key Note presentation; “Increasing project profitability through the use of custom-made, pre-fabricated stainless steel railing systems”. Although undeniably gorgeous, most builders shy away from recommending stainless steel railings to their clients. The challenge is that adding a stainless steel railing system to a home often requires the builder to subcontract the railings to a local metal fabricator, substantially increasing project costs. This presentation will include a discussion of how pre-fab railings work, as well as recommendations on when and where to suggest pre-fab rails to your clients. Included in this presentation will be a panel discussion with some remodelers who will discuss how and when they have incorporated pre-fab stainless steel rails into their interior and exterior projects. The resort features a waterfront hotel, full-service spa, high-tech meeting spaces and the excitement of casino nightlife with table games, slots, dedicated Keno and Poker rooms plus much more! Call: 866.609.8700 Follow the prompts for hotel reservations. Please say you are with the NADRA group. Release date is June 10th. The ENTIRE Resort is SOLD OUT except for NADRA’s block of rooms. Do not wait to make your reservation. Online registration and sponsorship opportunities will be available online very soon. If you are interested in getting involved or sponsoring this big event, please contact NADRA.